Offering goods at Auction, either locally or in the global marketplace has advantages and disadvantages. Achieving a successful result is dependant on the state of the marketplace at a given time, and the nature of the property being offered. Lux will review your goods and make recommendations as to what type of auction will best suit your property and situation. The confidence of local access to the buyer and the auction gallery’s vetting process. The ease of delivery of goods. limited access to the broader marketplace. Longer period to place property at auction and complete payment (as much as 120 days). Typically higher fees than on-line. Global access to your property. Virtually immediate listing time and short completion of payment ( 2-3 weeks). Smaller fees than traditional auction. Lack of local access to the buying party. Greater requirements in payment and delivery. Possibly not as beneficial for goods of local regional interest. Greater failure rate as a result of a buyers’ inability to examine property before purchase. 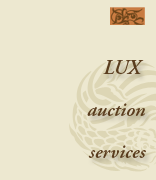 Lux Estate Services would be pleased to help you select the best approach to selling your property at Auction. Upon examination of the property we would consult with you regarding your options and recommend a strategy best suited for each item. Act as agent for the sale of your property, arranging all aspects of the process. Negotiate a commission rate for services based on the value of the property. Select a suitable regional Gallery to offer the property at auction. Negotiate a dealer rate for commission and a reserve (if desired). Confirm a pre-auction estimate (most galleries require a $1,000.00 minimum). Deliver the property to Auction. Select a suitable method for On-Line sale (either to offer it directly on IGavel, Ebay or other on-line auction services, or through an intermediary service, which is well suited for very high value property). Research results on similar property and confirm a likely Auction result. Either offer the property without reserve or set a minimum opening bid ( fees may apply). Arrange for payment from buyer and deliver goods. Forward final payment to you. Lux is the sole Associate representing IGavel in the Bay Area. IGavel is an on-line Auction service restricted to professionals in the Antique, Appraisal and Auctioneering trades. 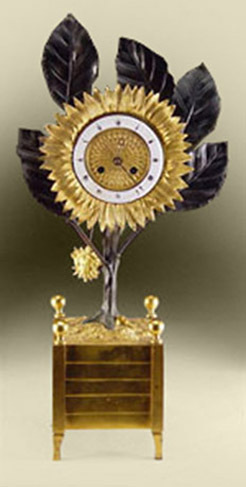 It is based in New York City and was founded by executives of Sotheby’s Auction. Your fine property can benefit from exposure through this exclusive site.